2014 West Coast Conference Preview — R.C. Sproul Jr.
Dr. R.C. Sproul Jr. is founder of Highlands Ministries and rector and chair of philosophy and theology at Reformation Bible College. Dr. Sproul Jr. is also a teaching fellow for Ligonier Ministries and has authored several books and series, including Economics for Everybody, Believing God, Tearing Down Strongholds, Bound for Glory, and The Call to Wonder. In addition to his bonus session on the theme of his teaching series Suffering and the Sovereignty of God, here’s a preview of what Dr. Sproul Jr. will be addressing next week at our 2014 West Coast Conference. In a post-Christian world, people who have rejected God often make an idol of the state, and the state often encourages such dependence. The twentieth century witnessed the rise of a particularly despotic form of statism in countries from China to Russia to Germany. What dangers do we face when the state attempts to replace God? In this session, Dr. R.C. Sproul Jr. discusses the dangers of statism and the way Christians should respond when they find themselves in a nation where statism has gained ascendancy. In the 1939 movie The Wizard of Oz, a tornado carries Dorothy and Toto to a faraway land. When they arrive, Dorothy says, “Toto, I have a feeling we’re not in Kansas anymore.” Many Christians feel the same sense of unease about the culture in which they now find themselves. Non-Christian ideologies and philosophies are now the norm. In this session, Dr. R.C. 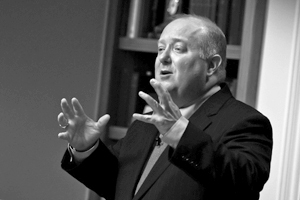 Sproul Jr. seeks to equip the church to intelligently engage this brave new world. You can listen to all of Dr. Sproul Jr.’s past conference messages here. Below is his message “A Good Offense” from our 2013 National Conference in which he reminded us that seeking to remove the offense of the gospel is to remove the gospel, and that seeking to remove the gospel is a denial of our Lord Jesus Christ. June 6-7, 2014, we will host our West Coast conference in Seattle, WA. The conference theme is “Overcoming the World: Being a Christian in a Post-Christian Culture.” Please consider joining Drs. Steven Lawson, Stephen Meyer, Albert Mohler, R.C. Sproul, and R.C. Sproul Jr. as they address modern challenges to the Christian and how we may effectively witness to the truth in a society that seems determined to overthrow every connection to its Christian heritage. Register today and save $20.